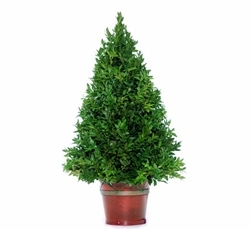 Home > Holidays > Trees & Topiaries > Original Boxwood 15"
This beautiful Holiday Tree is made with fresh Boxwood foliage and is sure to brighten up any home or event for the Holiday season. This tree is 15" tall and will last 2-3 weeks, or longer. You can add you own decorations to the tree, like lights or ornaments, to make it your own design at home!